Oil saw significant gains in anticipation of the strikes in Syria, but following U.S. efforts to ease geopolitical tensions in the region, crude prices have stabilized. 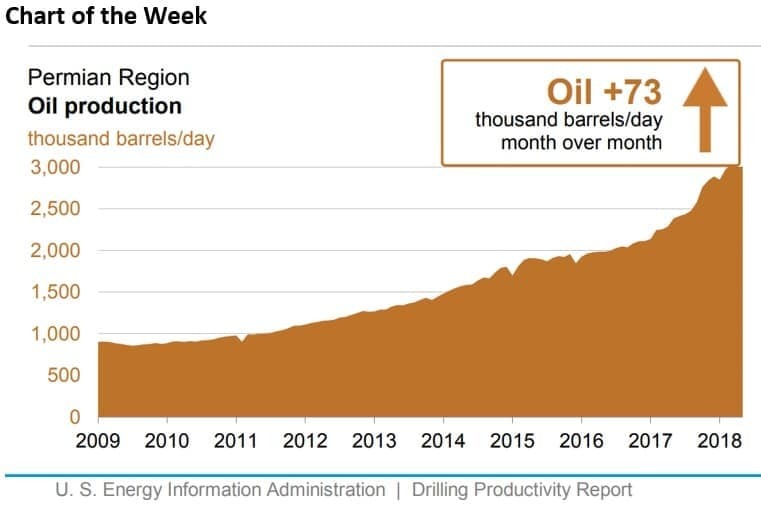 - U.S. oil production is expected to rise by another 125,000 bpd in May, compared to a month earlier. - The gains will, unsurprisingly, come from the Permian basin, which is expected to add 73,000 bpd. 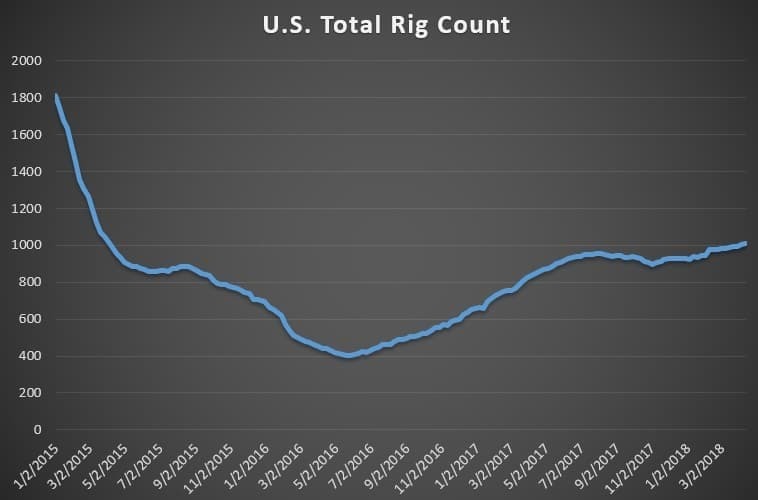 - Interestingly, the number of drilled but uncompleted wells (DUCs) continues to rise, an indication that supply chain bottlenecks are causing some delays. • Schlumberger (NYSE: SLB) is seeking compensation from ION Geophysical Corp for patent infringement in a case that was heard before the Supreme Court on Monday. If Schlumberger prevails, it will expand the ability of patent owners to recover damages that occur outside the U.S. Reuters reported that the justices seemed divided on the issue. • Enterprise Products Partners (NYSE: EPD) announced the full service of its Midland-to-Sealy pipeline, with expected capacity of 540,000 bpd. EPD said capacity will increase next month to 575,000 bpd. The pipeline will help alleviate some pressure upstream for crude trying to get out of the Permian. • ConocoPhillips (NYSE: COP) announced promising results from the six wells it drilled on Alaska’s Western North Slope, with oil encountered in all six wells. The results support Conoco’s estimate of a recoverable resource potential of at least 300 million barrels. Oil prices rose sharply last week in anticipation of U.S. airstrikes in Syria. Although Syria is only a marginal producer of oil, the fear was that the U.S. would get sucked into a broader conflict if it sparked retaliation from Russia or Iran. With only a narrow action taken by Washington, the threat of wider conflict abated. Oil fell on the news. In early trading on Tuesday oil held steady in anticipation of inventory drawdowns and comments from OPEC about a possible extension. Kuwait hints at OPEC extension into 2019. Oil prices firmed up after Kuwait said that OPEC would consider extending the production cuts into 2019. “OPEC and its allies are expected to control their supplies at levels that meet demand even after crude inventories decline,” Jun Inoue, a senior economist at Mizuho Research Institute Ltd, told Bloomberg. Canada offers financial support for Kinder Morgan pipeline. The Canadian federal government said it would enter talks with Kinder Morgan Canada (TSE: KML) to offer the company some financial support in order to get its Trans Mountain Expansion pipeline off the ground. The company idled the project because of opposition from British Columbia and said it would be entirely scrapped by the end of May if there wasn’t a resolution. Chevron will proceed with Gorgon LNG expansion. Chevron (NYSE: CVX) said it would move forward with the second stage of its massive Gorgon LNG project in Australia. 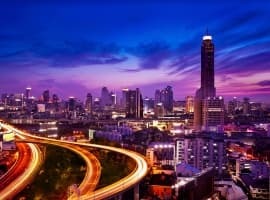 Chevron and its joint venture partners, ExxonMobil (NYSE: XOM) and Royal Dutch Shell (NYSE: RDS.A) spent more than $50 billion on the initial project. The second phase will consist of new natural gas wells drilled offshore, plus subsea structures and pipelines to move the gas to the onshore LNG export facility. Chevron declined to offer cost details. Investors step up bullish bets. Hedge funds and other money managers continued to ratchet up their bullish bets on oil prices last week, although the buying is increasingly concentrated in Brent as opposed to WTI. The extraordinary lopsided nature of the positions exposes oil prices to a short-term price correction if sentiment sours. 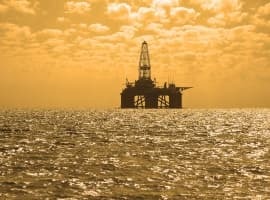 China’s shale gas to double within three years. China’s shale gas output could reach 17 billion cubic meters by 2020, double production levels from 2017, according to Wood Mackenzie. Much of the gains will come from the Southwest. Still, despite the gains, LNG imports are expected to continue to rise rapidly – imports could jump by another 25 percent this year after hitting record highs last year. Mexican presidential frontrunner won’t roll back energy reforms. An advisor to the frontrunner to become Mexico’s next president said that the oil and gas industry shouldn’t be worried about the next administration rolling back the privatization that opened up Mexico’s energy sector to international investment after seven decades of state-run monopoly. Canada’s oil industry returns to profit. 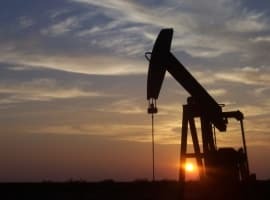 Canada’s oil industry could post a small profit this year after three consecutive years of losses. The industry posted $32 billion in losses over the past three years, but are on track to collective take in a small $1.4 billion. Shell to cut emissions but seeks to reject shareholder action. A proposed shareholder resolution before Royal Dutch Shell (NYSE: RDS.A) would call for specific targets for the company to reduce its greenhouse gas emissions. CEO Ben van Beurden opposes the move, but at the same time has made a commitment that the company would make most of its money from clean energy within 20 years. Shell is trying to navigate the treacherous path of pivoting to cleaner energy while not abandoning its core business in the short run. Shell’s plan relies heavily on natural gas taking up a greater share of its portfolio. Meanwhile, BP (NYSE: BP) said it would try to keep its emissions flat over the decade through 2025, a goal that would be achieved by reducing methane emissions, limiting flaring, relying more on gas and stepping up investment on clean energy. The cautious but notable effort at energy transition stands in sharp contrast to BP and Shell’s American competitors. Venezuela’s oil refineries at 31 percent capacity. Venezuela’s oil refineries operated at just 31 percent of their combined 1.62 million-barrel-per-day capacity in the first quarter, according to Reuters. PDVSA’s refineries suffer from poor maintenance, a lack of spare parts, a lack of cash, and a declining supply of crude. Meanwhile, Reuters reports that PDVSA is suffering from mass resignations, with workers walking off the job because of low wages and unsafe working conditions. About 25,000 workers quit between January 2017 and January 2018. Tesla to idle Model 3 production temporarily. Tesla (NASDAQ: TSLA) is suspending production of the Model 3 for a few days to smooth out the bumps in its manufacturing line. The pause is another blow for Elon Musk, who has struggled to ramp up production of the iconic electric vehicle. Last week, Musk acknowledged that “excessive” automation in the company’s manufacturing line had been a mistake. EU considers Iran sanctions. The WSJ reports that several European nations are considering support for new sanctions on Iran as a way to entice the U.S. to remain in the Iran nuclear deal. Others are skeptical that additional sanctions would be enough to convince the U.S. President. No decision has been made yet.